Over the last ten days, many Twitter users have found the total counts listed by their profile off by as much as three times. While the focus of the popular microblogging service is around the conversations and links, statistics and numbers continue to draw attention, so such a massive change has people asking questions. Meanwhile, the company's help forum shows the bug was initially a low priority issue, anticipated to only impact a few users, since found to be much more widespread. The team is working on it, and expects it to be resolved "relatively soon", with the latest update posted Friday, February 5th. The issue does not impact anyone's ability to send updates or see updates from others. It also does not mean that tweets were previously sent in triplicate, nor does it mean their are ghost tweeters updating on your behalf, so the bug is a minor one, albeit annoying for those who like to keep their data clean. The known issue, titled as "inflated tweet count" was posted to the help forum on January 25th, and users affected were asked to identify themselves, while showing what the anticipated disparity was between actual usage and reported usage. By February 2nd, Twitter's team said it was "a low priority issue" and said they "did not expect to have this issue fixed in the immediate future for this reason". But by Friday, the tone had changed. An update said, "This problem is now important and have engineers currently working on resolving the improper tweet counts." Like the examples I am including here, my own stats have been tripled, from what is likely in the range of 4,300 updates to more than 12,000. 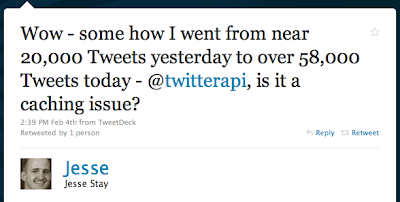 Not a big deal to me, but others are asking in public, and I thought it made sense to show Twitter is working on it. Like other occasional stats-related bumps on the service in the past, I would assume this to be reversed relatively quickly. And if it's not, there's always TweetStats.